Jonathan Tarbox, PhD, BCBA-D, is the Program Director of the Master of Science in Applied Behavior Analysis program at the University of Southern California, as well as Director of Research at FirstSteps for Kids. Dr. Tarbox is the Editor of the journal Behavior Analysis in Practice and serves on the editorial boards of multiple scientific journals related to autism and behavior analysis. He has published four books on autism treatment and well over 70 peer-reviewed journal articles and chapters in scientific texts. His research focuses on behavioral interventions for teaching complex skills to individuals with autism, treatment of feeding disorders, and the application of Acceptance and Commitment Therapy to applied behavior analysis. Courtney Tarbox, MS, BCBA, is a Regional Clinic Director at FirstSteps for Kids, an ABA service provider offering comprehensive intervention to children on the autism spectrum. Her early work in developmental disabilities included working in therapeutic, residential, and educational settings, with individuals diagnosed with a variety of developmental disorders and ranging in age from early childhood to adolescence. Ms. Tarbox has worked at FirstSteps since 2009 and is responsible for designing and overseeing individualized treatment plans that are unique to each child’s needs, as well as monitoring the service provision implemented by behavior technicians to ensure that competent and dedicated individuals are providing intervention leading to meaningful progress for the children with whom they work. Ms. Tarbox is actively engaged in treatment evaluation research and has published in peer-reviewed journals. Ms. Tarbox is a regular presenter at autism and ABA conferences and gives parent and community presentations with the aim of dispelling common misconceptions about ABA treatment for children with autism. It was a great experience to read this book. 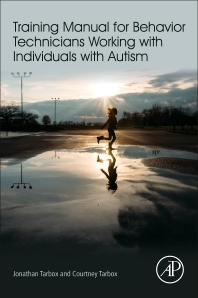 It was my very beginning on this field, working with children with autism, and I can tell this book taught me a lot. It's super easy to understand, the words they used are non technical, so you as a beginner can feel comfortable reading it. It gives you several examples of every situation and concepts. Of course, it's not the only book you should read about this topic, but it's a great complement. I found this book easy to read, cover all areas of RBTs task list. Will recommend it for those preparing for RBT certification exam.